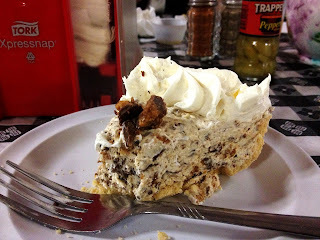 Pieday: Pecan cream cheese at the Red Rooster Bistro. I’ve been hearing about the Red Rooster for years. 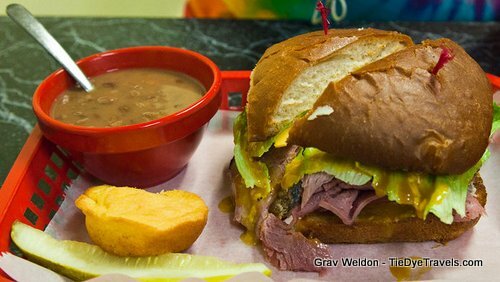 Alma’s best place to grab a good hearty bite of something. Good pie. 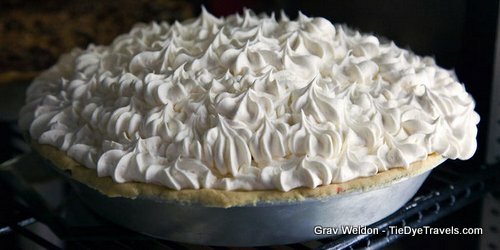 GREAT pie. But I’d written it off when it closed a few years ago. Then… well, there’s this pie, you see. This great and awesome collection of pies that have been popping up at all places — a truck stop in Dyer. Great pies. Strawberry. Millionaire. Chocolate cream. Sundae. Butterfinger. I mean, some serious pies. So, as it turns out, the Dyer Truck Stop has Red Rooster pies. But Red Rooster pies are still also found at the Red Rooster Bistro. Confused? At first, so was I. But it’s really not all that crazy. After the management change, shutdown, restart and what have you, Red Rooster Bistro is still home to great pies. So how does the truck stop fit in? 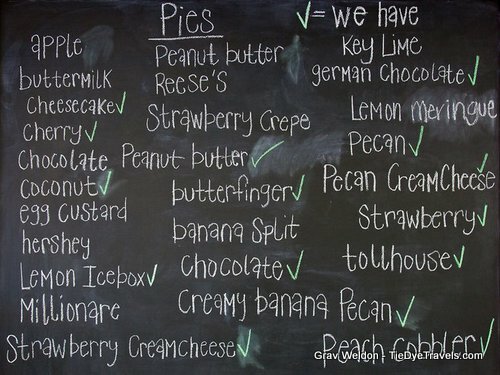 Okay, this all started a couple of months ago, when I put out an all-call for folks to tell me where they’d found the best pies in Arkansas. Several people told me about the Red Rooster, but I thought it was long gone. Then my photographer stopped in at this truck stop one night and noticed this pie case. 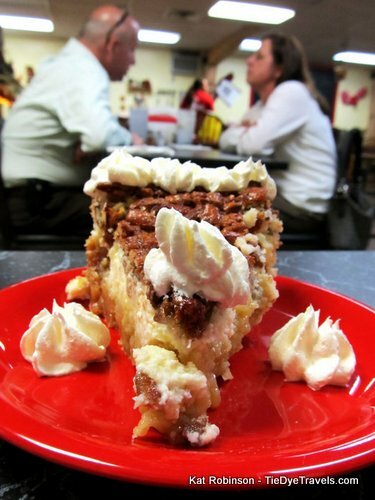 He knew I’d been looking for pies here and there, so he brought me a slice — of banana nut pie. I have to admit, it wasn’t my favorite but it did hit the spot just right. It was a great banana cream with pecans in it. That was cool. Next time down he brought a piece of Tollhouse pie for our group to taste. 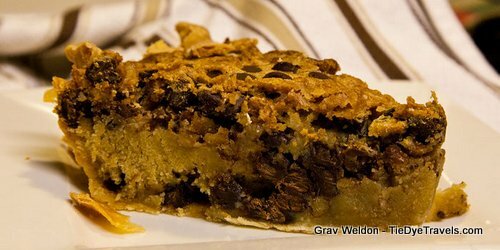 It was like eating a big light cookie — not too heavy, not too rich, kinda crumbly and generally well-liked. I thought that was a winner. strawberry pie I’d ever had, down at Strawn’s Eat Shop in Shreveport. That good… not too gelatinous, nicely tart and sweet. That one never got a chance for a photo, I was too greedy. But here’s a shot of what a whole strawberry pie looks like. And then there was the sundae pie — a banana cream pie with a delightful layer of pineapple foam between top and bottom, drizzled in chocolate syrup with maraschino cherries on top. And the Butterfinger pie — by that point everyone’s bringing me pie, and this one was so good I ate it out of the box with my bare fingers. My my. Okay, it was time for me to go get some pie. So I arranged a break in my schedule just for a drive to Alma to get this pie. But I couldn’t just get pie… I wanted sustenance. So my traveling companion and I ordered sandwiches — he the Airedale (named after the school mascot) and I theDagwood. We even asked our extraordinarily friendly waitress if she’d make sure our pie choices were set aside. Once a pie is gone from the case, it’s gone for the day. Now, I have to tell you — I can’t NOT tell you about the sandwiches. They came out on big square housemade buns that were a splendid cross between sourdough and King’s Hawaiian Bread, both sweet and salty and so good. 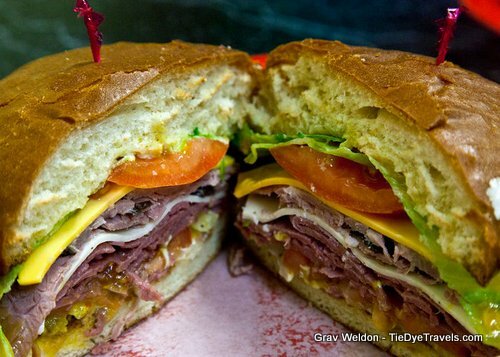 My Dagwood ($6.75) was layers of corned beef and roast beef with both Swiss and American cheeses, Miracle Whip and sweet & spicy mustard, lettuce and tomato, pickle and onion and a touch of Italian dressing. It was amazing. 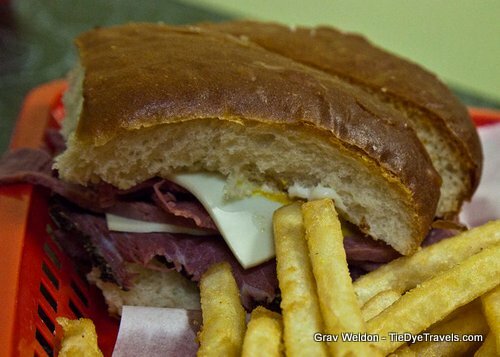 It was both hearty and a little sweet, like an entire meal in one sandwich. I had beans and cornbread as my side and was quite pleased with both. 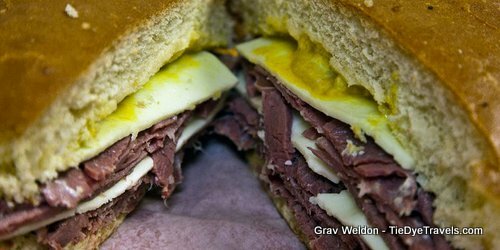 My companion’s was similar, the Airedale ($7.29) was corned beef, pastrami and Swiss cheese with sweet mustard on the same roll. I preferred mine, but then again, mine had vegetation and Miracle Whip. Anyway, our slices come out. 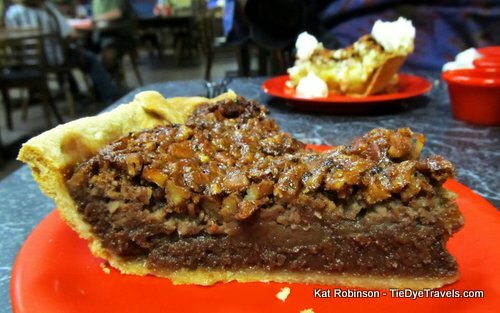 And I have to say, the German Chocolate pie was amazing — a great brownie-type pie laced through with coconut and bits of pecans, not too sweet and very dense. It was quite spectacular. 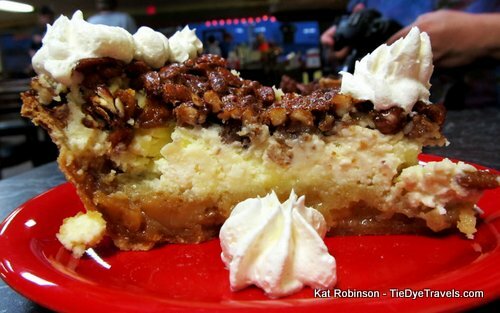 But it paled in comparison to the star attraction at Red Rooster Bistro — and that has to be without a doubt its Pecan Cream Cheese Pie. I mean, yes, it’s a pecan pie, but it’s not. Think about the great pecan custard base you get on a pecan pie, nice and sticky and soaking into a flour-butter crust. Think about the pecan topping. Now imagine that with a light, barely sweet cream cheese filling, almost like cheesecake. Can’t imagine it? You have got to go try it. I mean, you really do. It’s that good. So, turns out the folks at Red Rooster provide the pies to the Dyer truck stop. And herein lies the secret I’m going to share with you. Want that good pie? If you’re coming from this direction, stop there first. There’s a pie case on the counter next to the fried things. There are more slices to find there a lot of the time. Plus, if you’re just grabbing and going, it’s the right thing to do. You’ll find the Dyer Truck Stop on the south side of I-40 at Dyer. Red Rooster Bistro is on the main drag at 221 Highway 71 North in Alma. (479) 632-1362. Check it out. Our latest trip back to the Red Rooster Bistro in Alma surprised us... sadly, not in a good way. The pies are still there, still remarkable and still as plentiful -- but the slices have now gone from a six-to-a-pie size to an eight-to-a-pie size. However, we're loving on the Reece's Peanut Butter Cup pie. Sweet cream and peanut butter cups with chocolate shavings is pretty awesome -- but the true secret is the peanut butter infused bottom crust. Excellent. The owners of Red Rooster used to own the Dyer Truck Stop years ago as well. The pie are past down recipes in that family.